It is fairly well known that Elvis’s favorite food was a deep fried peanut butter and banana sandwich. The anniversary of Elvis Presley’s birthday is January 8th, and it’s the perfect time for fans (whether you’re fans of The King’s music or just of food) to try out an Elvis-inspired treat that uses both peanut butter and bananas. My hat tip is a banana bread with a peanut butter and cream cheese layer swirled throughout. It’s not deep fried, but Elvis would probably approve anyway. The recipe starts out as a fairly basic banana bread with mashed bananas, spices and vegetable oil. In fact, you could bake it on its own and get a great tasting loaf. All you really need to have on hand is some ripe bananas and you’re ready to go. As with most banana breads, it’s not crucial to be completely exact with the amount of mashed banana you use. If your bananas are on the large size and leave you with an extra tablespoon or two, either take a bite to even things out or just mix it into the batter with the rest. The peanut butter ribbon is what makes this quick bread a little more interesting. The layer is almost like a peanut butter flavored cheesecake, thanks to the inclusion of cream cheese. The cream cheese gives the peanut butter layer a lot of substance and allows it to really stand out in looks and texture from the rest of the loaf. Peanut butter on its own would really blend into the loaf during baking. 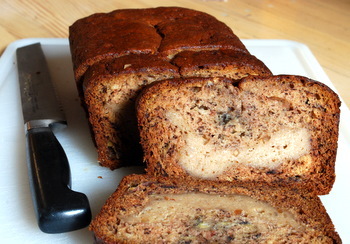 The peanut butter flavor is not overwhelming, but definitely is a nice twist on the plain banana bread. I’d recommend using a crunchy peanut butter (I used an organic peanut butter, but the recipe should still work with a national brand if that’s what you have at home) over a smooth peanut butter; little bits of nut add great texture to the filling. Make the cream cheese filling. In a medium bowl, beat together cream cheese, peanut butter, egg yolk and sugar until smooth and fluffy. In a large bowl, whisk together flour, baking soda, salt and ground spices. In a medium bowl, whisk together mashed banana, sugar, oil and eggs. Pour into dry ingredients and stir until just combined and no streaks of flour remain. Do not over mix. Pour half of banana batter into prepared loaf pan. Spoon peanut butter mixture on top, spreading it into as even a layer as possible. Pour remaining banana batter on top, again spreading it into an even layer. Bake for 1 hour, until a toothpick inserted into the center of the cake comes out clean (or with a few moist crumbs) and the top springs back when lightly pressed. Turn loaf out of the pan onto a wire rack. Cool completely before slicing. Mmmm, this looks AMAZING. I will have to try that…wow! That’s beautiful! It looks delicious. MMM! That loaf looks delicious, and I am going to try baking some myself! One question — is using natural peanut butter okay? Or is using the processed stuff best? Love it! I make a whole grain dark chocolate peanut butter banana bread (link) that is to die for but the inclusion of cream cheese only sweetens the deal. I’ll be making a batch soon to freeze and I’ll be trying your cream cheese swirl! That sounds like pure heaven! How perfect for a brunch! Yum! I bet this would work for muffins too. Magic words: “peanut butter swirl” — yum! This looks like an amazing treat! Oh it looks soo good!!! This is in the oven right now and it smells divine! Can’t wait to cut into it! Thanks for this great recipe! I was just looking at three very ripe bananas on the counter (I never throw them away) and was about to make my usual bor ning muffins, but this trumps those! Thanks! Sounds delicious! Just because I love the combination, I would probably drizzle some melted chocolate or the top or throw in some chocolate chips. I just love the combo of pb & banana. I recently found a wonderful, almost perfect, recipe for banana bread from the famous Mama Dip (you may have heard of her?). Someone gave us a loaf of banana bread for Christmas, and it was a little dry. So, I solved that problem by slathering it with peanut butter. It was SO good…I ate almost the whole loaf in one sitting. This is brilliant, and I’m going to try it! Thanks! Made this last night and it was absolutely delicious. Awesome! I’m going to try this recipe. I love peanut butter and bananas and my breads actually turn out decent. My husbands birthday was also on the 8th! I wish I had seen this earlier. It would have been fun to have at our dinner party. As soon as I saw this recipe, I knew I had to try it out. I love banana bread, and the filling is very similar to the peanut butter-cream cheese mixture in Bakingblonde’s peanut butter cream cheese brownies, which I have made several times. I baked my own loaf of peanut butter swirl banana bread last night and had some this morning for breakfast–it was fantastic! The filling and the bread are a great combination. Thanks for sharing the recipe. It’s awesome! I don’t know what I did wrong, but the whole thing fell apart! Plus, there was so much batter that it overflowed. The 9X5 pan is too small. This would be really good in a bundt pan or in a muffin pan. The flavor was amazing, though. My husband and I just ate it with our fingers. It was too fragile to cut as pictured. Cristie – I’m sorry you had that result. I’m surprised, as banana breads (this one included) are more on the heavy side of the spectrum than the dense and falling apart one. No idea what could have gone wrong – but I am glad to hear that you and your husband enjoyed the flavor! Ah, I should also note that I’m glad to see that others are enjoying the recipe and having good success with it! This worked just fine for me…can’t think of what cristie did wrong. It turned out darker than I expected, and I thought that the crust would be too done, but it was perfect. My husband said that it could very well be the best banana bread he’s ever had. Yeah! I substituted one cup of the AP flour with Whole Wheat Pastry Flour, and I couldn’t tell at all. (trying to be a little more healthy) I also used lite cream cheese, cuz I HAD to make this, and it was all I had in the fridge. Also, I only had creamy peanut butter… It was soooo yummy! Fabulous recipe…thank you! It looks delicious, I like it.. I am glad to hear that you and your friends enjoyed the flavor!